Howard W. Hewitt – Former Wabash College basketball Coach Mac Petty believes Pat Summit may have had an accomplishment few men coaches ever achieve. Her success forced the university to build a better and bigger arena. Summit, 64, died Tuesday morning after a much-publicized bout with Alzheimer’s. 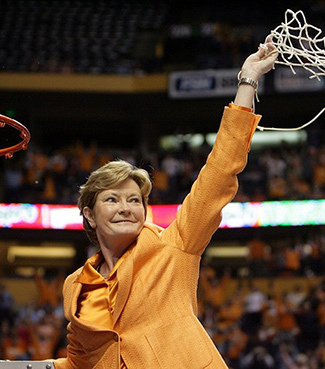 Summitt had more wins, 1,098, during her career than any coach – men or women. She won eight national NCAA championships in 38 seasons. Petty is a 1968 graduate from the University of Tennessee. He did not personally know Summitt, she was seven years younger. But he did have thoughts on her significant career. “The arena where they play now was probably built because of her success, not necessarily the men,” Petty said. “The men’s program wasn’t as successful during her early times there. We played in a facility that was brand new my last two years. When Summitt first started coaching Petty was in his final tenure at Sewanee, the 1975-76 season. Petty retired from Wabash in 2011 after 35 seasons and a DIII National Championship season in 1982. He is a member of the Indiana Basketball Hall of Fame. A private family service is planned in Knoxville. A memorial service will be held at the Thompson-Boling Arena.